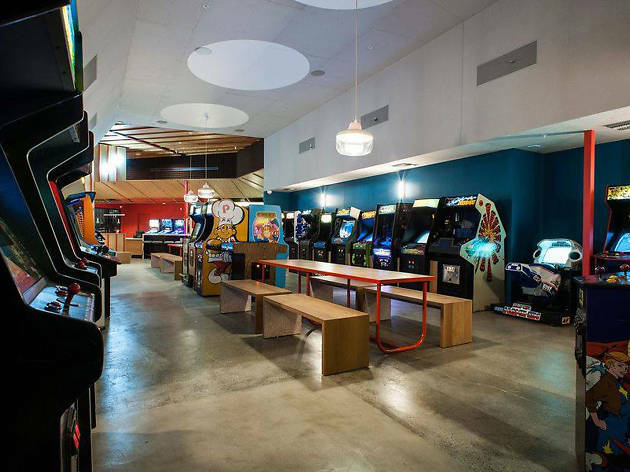 Whatever you want to call it—restaurant, bar, arcade—Button Mash has created a category all its own in LA. The food, which comes from once-underground-restaurant Starry Kitchen, is fantastic. Diners will recognize Starry Kitchen's famous crispy tofu balls, but there is far more on the menu to explore: incredible Vietnamese spring rolls, a decadent double cheeseburger, and a selection of rice dishes, noodles, sandwiches and larger plates, to be enjoyed at the bar or in the dining room. The drink menu includes a unique list of beer and wine, including Malbec Invaders, a 2014 Fabien Jouves varietal featuring Space Invaders aliens on the label. Button Mash has over 100 machines from the '70s to '90s, but they keep around 50 on the floor at one time, rotating the games in so there's always something new. Frogger, Tron, Donkey Kong, Food Fight, Michael Jackson's Moonwalker are just a sampling that populate the floor (some even have second, hidden games! ), and a row of pinball machines have their own section by the bar. Artist Joseph Harmon came up with the shiny tokens that display an arcade machine on one side and Button Mash's goofy-looking dog mascot on the other. Each game takes one token, the pinball machines take two, and you can buy $5 and $10 rolls from the bar. And don't worry—just because there's a bar doesn't mean the kids can't partake in the fun. Button Mash welcomes children of all ages to play games until 9pm; after 9pm, it's 21+. Fun spot to check out when you want to change up your usual restaurant/bar night out. There can sometimes be a hefty wait for the restaurant + certain games, to be expected with a place like this. Overall the food was fine, nothing extraordinary but certainly some interesting dishes. They had some tasty beer choices as well. The arcade games were fun for sure - a few ate our quarters and were broken though unfortunately. This place won't blow your mind, but it is absolutely a cool spot to hang out and grab some food/drinks/arcade time at if you're in the area and looking for something fun to do. 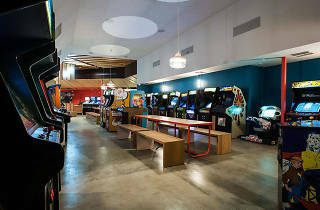 Out of all the trendy arcade bars in LA, Button Mash is my favorite for its great vibe, huge space, and awesome food. There's something here for everyone, so even your vegetarian friends will be happy! So dope. Good food. Great games. Decent prices. I recently went for a friends birthday and had a great time! There's tons of retro video games to play but something to note is that you have to get tokens, so be sure to bring cash with you! I didn't have a chance to try the food but it all looked delicious. Come here to grab a bite and a beer and have a blast playing arcade games. It's a loud space, and you'll have to wait a long time if you come in at peak eating times and expect to get a table, but if you play your cards right you can have a great time. It is very loud--not the place for quiet date--but the beer selection is great and the food is delicious. It can get overly crowded so there aren't enough games to go around (and that leads to an inordinate amount of people just standing around drinking, which only adds to the crowding) and lines are common after 9pm+. That said, somewhere there is always a game to play in the space. Go early, expect to find parking a couple of blocks away, play some Burger Time. I just don't understand the appeal of this place. Yes, video games are fun, and yes, the beer selection here is solid. But the cacophony inside is unbearable: it's so loud, there's so much going on, folks pile in and crowd the place and for what? It's certainly not the first barcade in town, and perhaps some will call it blasphemous, but the food is mediocre at best (sorry Starry Kitchen). I just don't see it lasting, and would much rather have a classy bar and restaurant taking up that prime piece of Echo Park real estate.